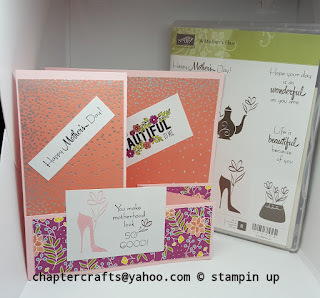 Mother's Day Z-fold card Stampin up! Hello and welcome back to Chapter Crafts. As you all know it's mother's Day in a few weeks so I decided to make this mother's Day z-fold card using mother's flair and just add text both from Stampin up! I've seen a few people making z-fold cards so I thought I'd give it a go. First you need Pink pirouette card stock cut to 7 7\8" x 11 5\8" and score @ 2 7\" & 5 7\8"
Cut 2" off the width after scoring, save this you will need it. 1st peice cut at 5 1\2" x 5 1\2"
2nd peice cut at 5 1\2" x 2 3\4"
3rd peice cut at 5 1\2" x 1 3\4"
Coloured ink used is basic black ink, lemon lime twist marker, calypso coral marker, berry burst marker.